SLATY THE JUNCO had been quite right in thinking it was going to snow some more. Rough Brother North Find hurried up one big cloud after another, and late that afternoon the white feathery flakes came drifting down out of the sky. Peter Rabbit sat tight in the dear Old Briar-patch. In fact Peter did no moving about that night, but remained squatting just inside the entrance to an old hole Johnny Chuck's grandfather had dug long ago in the middle of the clear Old Briar-patch. Some time before morning the snow stopped falling and then rough Brother North Wind worked as hard to blow away the clouds as he had done to bring them. When jolly, round, bright Mr. Sun began his daily climb up in the blue, blue sky he looked down on a world of white. It seemed as if every little snowflake twinkled back at every little sunbeam. It was all very lovely, and Peter Rabbit rejoiced as he scampered forth in quest of his breakfast. He started first for the weedy field where the day before he had found Dotty the Tree Sparrow and Slaty the Junco. They were there before him, having the very best time ever was as they picked seeds from the tops of the weeds which showed above the snow. Almost at once Peter discovered that they were not the only seekers for seeds. 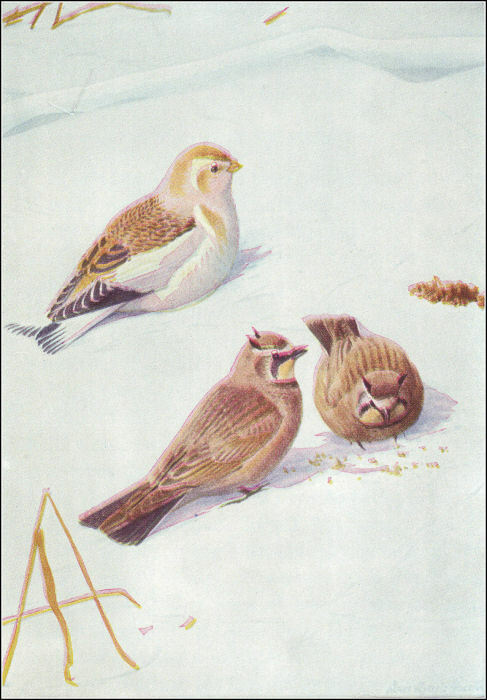 Walking about on the snow, and quite as busy seeking seeds as were Dotty and Slaty, was a bird very near their size the top of whose head, neck and back were a soft rusty-brown. There was some black on his wings, but the latter were mostly white and the outer tail feathers were white. His breast and under parts were white. It was Snowflake the Snow Bunting in his winter suit. Peter knew him instantly. There was no mistaking him, for, as Peter well knew, there is no other bird of his size and shape who is so largely white. He had appeared so unexpectedly that it almost seemed as if he must have come out of the snow clouds just as had the snow itself. Peter had his usual question ready. The one small bird who is largely white. His yellow throat and forehead and the two little tufts of feathers, like tiny horns, will always identify him. "Are you going to spend the winter here, Snowflake?" he cried. Snowflake was so busy getting his breakfast that he did not reply at once. Peter noticed that he did not hop, but walked or ran. Presently he paused long enough to reply to Peter's question. "If the snow has come to stay all winter, perhaps I'll stay," said he. "What has the snow to do with it?" demanded Peter. "Only that I like the snow and I like cold weather. When the snow begins to disappear, I just naturally fly back farther north," replied Snowflake. "It isn't that I don't like bare ground, because I do, and I'm always glad when the snow is blown off in places so that I can hunt for seeds on the ground. But when the snow begins to melt everywhere I feel uneasy. I can't understand how folks can be contented where there is no snow and ice. You don't catch me going 'way down south. No, siree, you don't catch me going 'way down south. Why, when the nesting season comes around, I chase Jack Frost clear 'way up to where he spends the summer. I nest 'way up on the shore of the Polar Sea, but of course you don't know where that is, Peter Rabbit." "If you are so fond of the cold in the Far North, the snow and the ice, what did you come south at all for? Why don't you stay up there all the year around?" demanded Peter. "Because, Peter," replied Snowflake, twittering merrily, "like everybody else, I have to eat in order to live. When you see me down here you may know that the snows up north are so deep that they have covered all the seeds. I always keep a weather eye out, as the saying is, and the minute it looks as if there would be too much snow for me to get a living, I move along. I hope I will not have to go any farther than this, but if some morning you wake up and find the snow so deep that all the heads of the weeds are buried, don't expect to find me." "That's what I call good, sound common sense," said another voice, and a bird a little bigger than Snowflake, and who at first glance seemed to be dressed almost wholly in soft chocolate brown, alighted in the snow close by and at once began to run about in search of seeds. It was Wanderer the Horned Lark. Peter hailed him joyously, for there was something of mystery about Wanderer, and Peter, as you know, loves mystery. Peter had known him ever since his first winter, yet did not feel really acquainted, for Wanderer seldom stayed long enough for a real acquaintance. Every winter he would come, sometimes two or three times, but seldom staying more than a few days at a time. Quite often he and his relatives appeared with the Snowflakes, for they are the best of friends and travel much together. Now as Wanderer reached up to pick seeds from a weed-top, Peter had a good look at him. The first things he noticed were the two little horn-like tufts of black feathers above and behind the eyes. It is from these that Wanderer gets the name of Horned Lark. No other bird has anything quite like them. His forehead, a line over each eye, and his throat were yellow. There was a black mark from each corner of the bill curving downward just below the eye and almost joining a black crescent-shaped band across the breast. Beneath this he was soiled white with dusky spots showing here and there. His back was brown, in places having almost a pinkish tinge. His tail was black, showing a little white on the edges when he flew. All together he was a handsome little fellow. "Do all of your family have those funny little horns?" asked Peter. "No," was Wanderer's prompt reply. "Mrs. Lark does not have them." "I think they are very becoming," said Peter politely. "Thank you," replied Wanderer. "I am inclined to agree with you. You should see me when I have my summer suit." "Is it so very different from this?" asked Peter. "I think your present suit is pretty enough." "Well said, Peter, well said," interrupted Snowflake. "I quite agree with you. I think Wanderer's present suit is pretty enough for any one, but it is true that his summer suit is even prettier. It isn't so very different, but it is brighter, and those black markings are much stronger and show up better. You see, Wanderer is one of my neighbors in the Far North, and I know all about him." "And that means that you don't know anything bad about me, doesn't it?" chuckled Wanderer. Snowflake nodded. "Not a thing," he replied. "I wouldn't ask for a better neighbor. You should hear him sing, Peter. He sings up in the air, and it really is a very pretty song." "I'd just love to hear him," replied Peter. "Why don't you sing here, Wanderer?" "This isn't the singing season," replied Wanderer promptly. "Besides, there isn't time to sing when one has to keep busy every minute in order to get enough to eat." "I don't see," said Peter, "why, when you get here, you don't stay in one place." "Because it is easier to get a good living by moving about," replied Wanderer promptly. "Besides, I like to visit new places. I shouldn't enjoy being tied down in just one place like some birds I know. Would you, Snowflake?" Snowflake promptly replied that he wouldn't. Just then Peter discovered something that he hadn't known before. "My goodness," he exclaimed, "what a long claw you have on each hind toe!" It was true. Each hind claw was about twice as long as any other claw. Peter couldn't see any special use for it and he was just about to ask more about it when Wanderer suddenly spied a flock of his relatives some distance away and flew to join them. Probably this saved him some embarrassment, for it is doubtful if he himself knew why Old Mother Nature had given him such long hind claws.